The Alight 8.2 CA from Blizzard is a great ski for the intermediate to advanced skier looking for a lightweight and easy to control ski for carving up the groomers. The 82mm waist feels very nimble and agile, while being able to motor through crud and heavy snow. Blizzard's W.S.D. (Women's Specific Design) keeps the ski lighter and less fatiguing by using a Lite Wood Core and a moved up mounting position. The Suspension System is made from a Polyamide Structure that is incorporated into the ski and connected to an elastic dampener that smooths out vibrations for a quiet and stable ride. A Compound Sidewall IQ Construction drives a firm edge into the firmest of snow conditions. Rocker in the tip and tail increase your maneuverability and offers quick and effortless turning. If you are an intermediate to advanced skier looking for a fatigue-free and stable ride, the Blizzard Alight 8.2 CA is a ski you need to try. 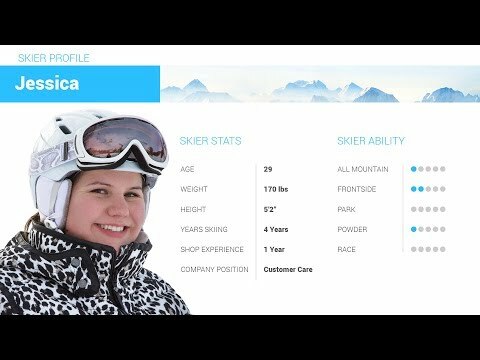 2019 Blizzard Alight 8.2 CA Ski Review by Jessica. 2019 Blizzard Alight 8.2 CA Ski Review by Whitney . 2019 Blizzard Alight 8.2 CA Ski Review by Jessi.